Tennessee had a smaller percentage of slaves than most other Southern states and was the last state to join the Confederacy. Consequently, many believe slavery was "not as bad" in Tennessee as it was in the rest of the South. In this fascinating book, author Bill Carey explains how slavery was embedded in every level of Tennessee society; that many families which didn't own slaves leased them; that local governments used slave labor; that court officials routinely sold small children away from their families; and that professional slave traders operated in all parts of the state. Primarily relying on newspapers and first-person accounts, Carey points out that slavery affected all levels of society and that every resident of antebellum Tennessee would have been accustomed to the sight and sound of enslaved "chain gangs" (known as coffles) being herded from one place to another. 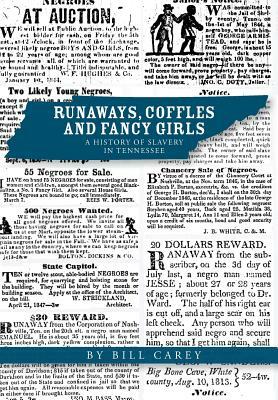 - Data from more than 900 runaway slave ads published in Tennessee newspapers from 1792 until 1864. - Advertisements for slave traders such as Isaac Bolton, Nathan Bedford Forrest and Rees W. Porter which were commonplace in their day but will strike current readers as disturbing. - Precise descriptions of the 24 slaves bought by the government of Nashville in 1830 and taken away from their families in Virginia and Maryland. - Proof that slaves were given away in several Tennessee lotteries--including one that raised money for state government. - Evidence that a slave died in the construction of the Tennessee State Capitol. - Detailed information about court-mandated slave sales on the steps of courthouses across the state.